For those who adopt the somewhat conventional – but woefully inaccurate – view that the Abbas/Fatah/PA regime controls the Palestinian Territories apart from Hamas-dominated Gaza, today’s news might cause some confusion. All three of today’s arrestees are from the Sur Baher neighborhood of Jerusalem. The accused are charged with contact with a foreign agent, membership in a terrorist organization and conspiring to carry out a terror attack. There’s a fourth suspect, identified in the news report as A. A. the prosecutors have not yet reached a decision as to whether to file charges against him. The arrests came after Israel Police and Shin Bet became aware of the plan to open fire on IDF service personnel at a bus stop outside Oranit, an Israeli community close to Rosh Ha’ayin. A town of about 9,000 residents, it straddles the 1948 ceasefire line – the so-called Kav Hayarok or Green Line. It’s located about 30 kilometers (say, 20 miles) from Israel’s business center, Tel Aviv. 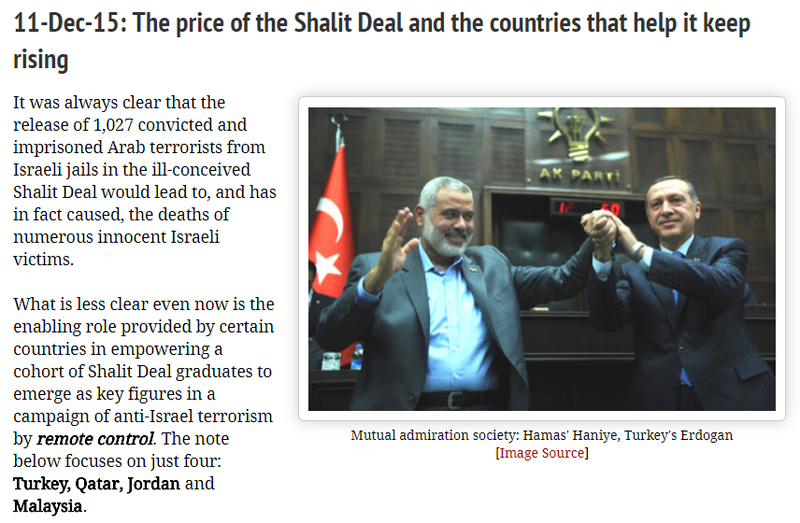 Atun and Amira traveled to Turkey last year to visit Hamas figures Mahmoud Atun and Musa Azari [sic], who were exiled under the Gilad Shalit prisoner exchange, and received thousands of dollars to help fund the attack. The Atun brothers of Sur Baher have a long and deep history of terrorist activity. Munir Marwat Atun and his brother the well-named Jihad Atun who were both arrested for being members of another terrorist/shooter cell seven years ago [“Shin Bet Nabbed Five Members of Hamas-linked Terror Cell in Jerusalem“, Haaretz, April 8, 2011]. A fourth brother, Mahmoud Atun was serving a life sentence in 2011 for murdering three Israelis, including Border Police Sgt.-Maj. Nissim Toledano, 29, in December 1992. After being incomprehensibly freed by Israel in the catastrophic Shalit Deal of October 2011, he’s now one of the Hamas king-pins who orchestrate murderous attacks on Israelis from their Turkish safe haven. 29-Nov-14: Is Turkey providing cover for Hamas terror? There’s some background about that violent Jerusalem neighborhood of Sur Baher here: “1-Dec-13: Living with stone-age neighbors“.